The consumer-goods giant is making up for sluggish sales growth by showering investors with cash. Call it the understatement of the fiscal year. Procter & Gamble (NYSE:PG) Chief Financial Officer Jon Moeller recently told investors that 2017 "is a year of significant value return to shareholders." Does $22 billion sound significant to you? That's how much the consumer-goods giant aims to deliver to its owners through dividends and stock repurchases. The mountain of cash is greater than the market capitalization of more than half of the members of the S&P 500, and it also represents a huge boost over P&G's average return pace of about $13 billion per year. With fiscal 2017 half done, let's check in on the company's progress implementing one of the stock market's biggest capital-return plans. P&G has spent $3.6 billion on dividend payments over the last six months, which is slightly less than in the prior-year period. Don't worry, though -- the blue chip is still a Dividend Aristocrat, with 60 years of consecutive annual hikes behind it. The lower overall payout is just a quirk caused by the combination of a falling share count and the company's tiny dividend boost for 2017. It's 1% increase put it far behind rival Kimberly-Clark (NYSE:KMB), which just gave its investors a 5% raise. P&G's next dividend increase is likely to close that gap, but not by as much as you might think. Its official payout ratio has plunged to just one-third of earnings over the last two quarters, compared to 76% in fiscal 2016. However, that improvement is mainly because reported profits spiked thanks to a one-time profit from brand divestments. Focus just on continuing operations, and the company's payout ratio is a high, but manageable, two-thirds of earnings, so P&G should have no problem hitting its $7 billion annual payment target. 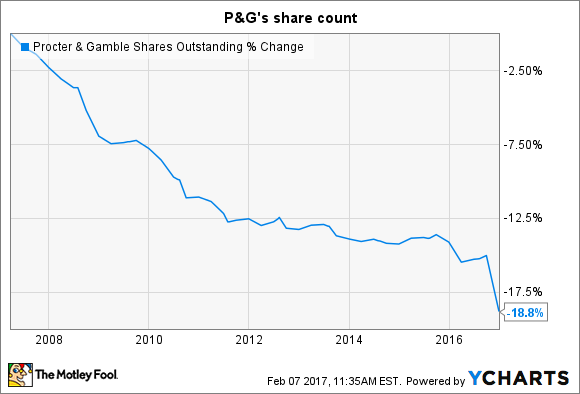 PG Shares Outstanding data by YCharts. Management has boosted its direct stock buyback spending to a $5 billion annual pace from $4 billion last year and $4.6 billion in 2015. The team is right on track with that goal, having spent $2.5 billion over the last six months. The good news for investors is that the outlay helped the outstanding share count fall 3% in the past year and by nearly 20% over the last decade. P&G last quarter closed its deal to sell 41 of its beauty brands to Coty. And as it did in the Duracell battery sale, the company structured the transfer so that it would result in a significantly reduced outstanding share count. It received $11.4 billion of total value from the beauty transaction, almost all of which went toward lowering its share count. Meanwhile, the $5 billion profit it recorded on the deal roughly doubled reported earnings, to $10.8 billion, through the first two quarters of the year. There are no comparable brand divestments in the works now that P&G has whittled its portfolio down to management's 66 favorite franchises from almost 170 in fiscal 2013. That effectively removes the single biggest piece of its return program for fiscal 2018 and beyond. However, the outlook for elevated capital returns is still healthy. P&G plans to slice a further $10 billion out of its expense structure over the next five fiscal years. Meanwhile, the negative pressure from foreign currency swings is likely to let up from the brutal pace of the last two years. And finally, core profit growth is back to its long-run average thanks to a solid uptick in P&G's growth rate. Add it all up, and executives believe they can return about $16 billion to investors per year in fiscal 2018 and fiscal 2019, which would put its average return at almost $18 billion per year, up from a $12 billion annual pace from 2010 through 2015.